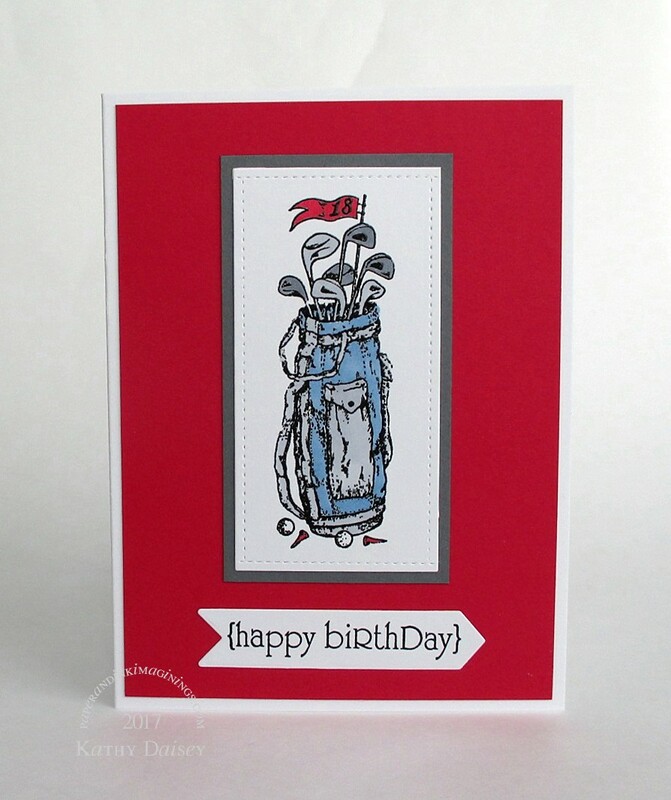 A card for my father-in-law. Supplies: Stamps – Papertrey Ink, PSX Designs, paper – Neenah Classic Crest Solar White, Stampin’ Up! Basic Gray, Real Red, inks – Copic B34, C3, C5, R29, VersaFine Onyx Black, dies – Lawn Fawn, Taylored Expressions, embossing powder – Filigree Fine Art Powder clear. Categories: birthday, card | Tags: card, Copics, Lawn Fawn, Neenah, Papertrey Ink, PSX Designs, Stampin' Up!, Taylored Expressions, Tsukineko, VersaFine | Permalink. 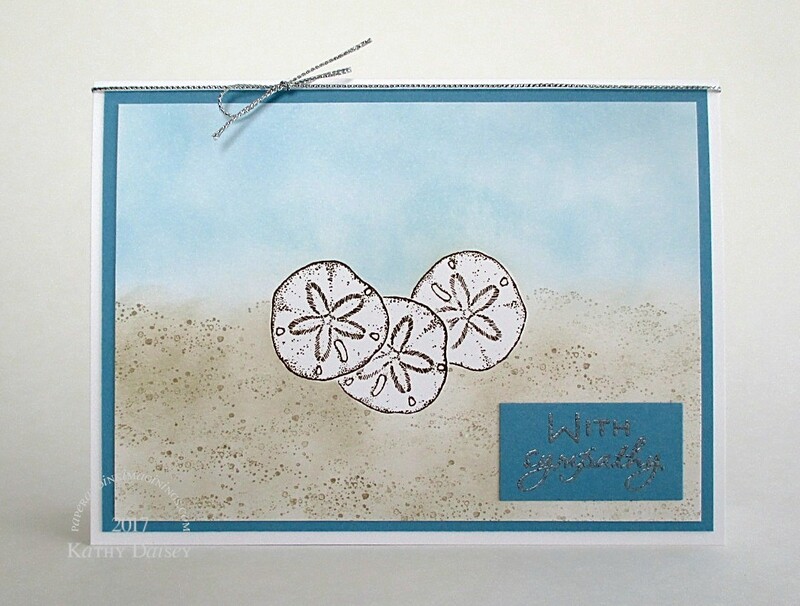 I stamped and embossed the sand dollars first, then masked them. After the sky and sand were blended in, I stamped the sand texture, and finally the sentiment. Supplies: Stamps – My Favorite Things, PSX Designs, paper – Neenah Classic Crest Solar White, Stampin’ Up! Soft Sky, Strathmore Bristol, inks – Tim Holtz/Ranger Distress Inks Antique Linen, Tumbled Glass, Stampin’ Up! Crumb Cake, VersaFine Vintage Sepia, embossing powder – Stampendous Gold Detail, linen thread – Stampin ‘ Up! Categories: card, sympathy | Tags: Bristol, card, My Favorite Things, Neenah, PSX Designs, Ranger, Stampendous, Stampin' Up!, Strathmore, Tim Holtz, Tsukineko, VersaFine | Permalink. I stamped the sand dollars first, masking as I went. Then, I blended the sky and the sand. Supplies: Stamps – Papertrey Ink, PSX Designs, Stampin’ Up!, paper – Neenah Classic Crest Solar White, Stampin’ Up! Marina Mist, inks – Stampin’ Up! Crumb Cake, Soft Suede, Tim Holtz/Ranger Distress Ink Tumbled Glass, die – Spellbinders, embossing powder – Ranger Silver Pearl, metallic cord – PaperMart. 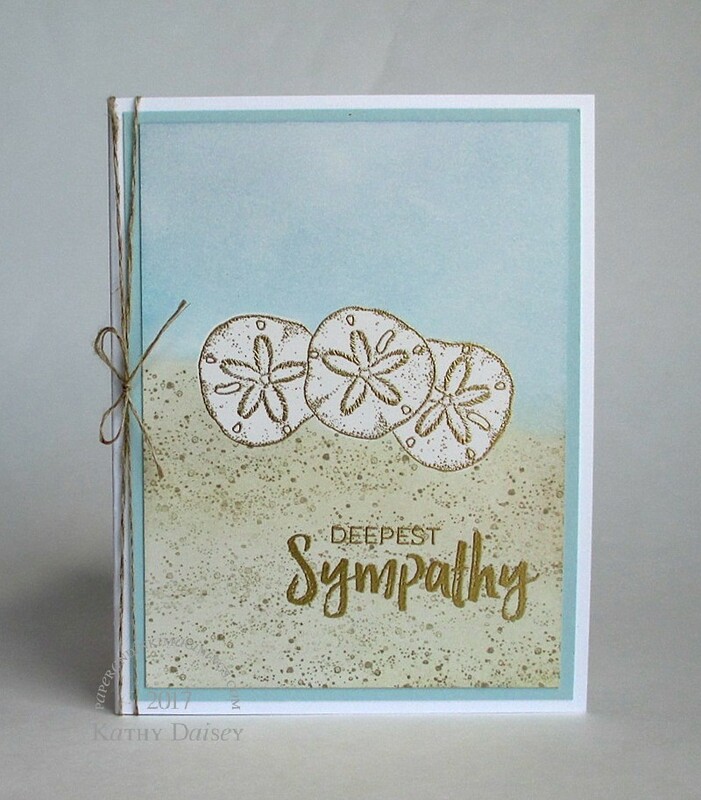 Categories: card, sympathy | Tags: card, Neenah, PaperMart, Papertrey Ink, PSX Designs, Ranger, Spellbinders, Stampin' Up!, Tim Holtz, Tsukineko, VersaFine | Permalink. I am working on ideas for a friend’s holiday cards. A work in progress. Supplies: Stamps – Essentials by Ellen, JustRite, PSX Designs, paper – Neenah Classic Crest Solar White, Stampin’ Up! Soft Sky, Stardream Metallic Juniper, Silver, inks – Stampin’ Up! Garden Green, VersaFine Onyx Black, Vintage Sepia, dies – Stampin’ Up! (filigree ornament, ornament topper), Spellbinders (solid ornament), Taylored Expressions (banner), embossing powder – Filigree Fine Art Powder clear, Ranger Silver Pearl, Stampendous Gold Detail, ribbon – Stampin’ Up!. Categories: card, holiday | Tags: card, Essentials by Ellen, JustRite, Neenah, PSX Designs, Ranger, Spellbinders, Stampin' Up!, Stardream, Taylored Expressions, Tsukineko, VersaFine | Permalink. The Essentials by Ellen Mistletoe & Holly set is on my workspace, I am trying to figure out personal Christmas card ideas. With all of the violence and death in the news the past month, the “I wish for peace” sentiment stamp spoke to me from a storage drawer. I masked the pine cones using Post-It notes before stamping the foliage and berries. The snow accents are Kirarina WiNK white pen. Supplies: Stamps – Essentials by Ellen, PSX Designs (sentiment), paper – Neenah Classic Crest Solar White, Stampin’ Up! Chocolate Chip, Crumb Cake, inks – Kirarina WiNK White, Tim Holtz/Ranger Distress Inks Fired Brick, Mowed Lawn, Vintage Photo, VersaFine Onyx Black, dies – Lawn Fawn, embossing powder – Stampendous! Gold Detail. Categories: card, holiday | Tags: card, Essentials by Ellen, Kirarina WiNK, Lawn Fawn, Neenah, PSX Designs, Ranger, Stampendous, Stampin' Up!, Tim Holtz, Tsukineko, VersaFine | Permalink. I stamped the sand dollar first, then masked it before blending the sand and the sky around it. Supplies: Stamps – Papertrey Ink, PSX Designs, paper – Neenah Classic Crest Solar White, Stampin’ Up! Marina Mist, inks – Kirarina WINK White Pearl, Stampin’ Up! Crumb Cake, Soft Sky, VersaFine Smoky Gray, die – Spellbinders, embossing powder – Ranger Silver Pearl, silver cord – PaperMart. 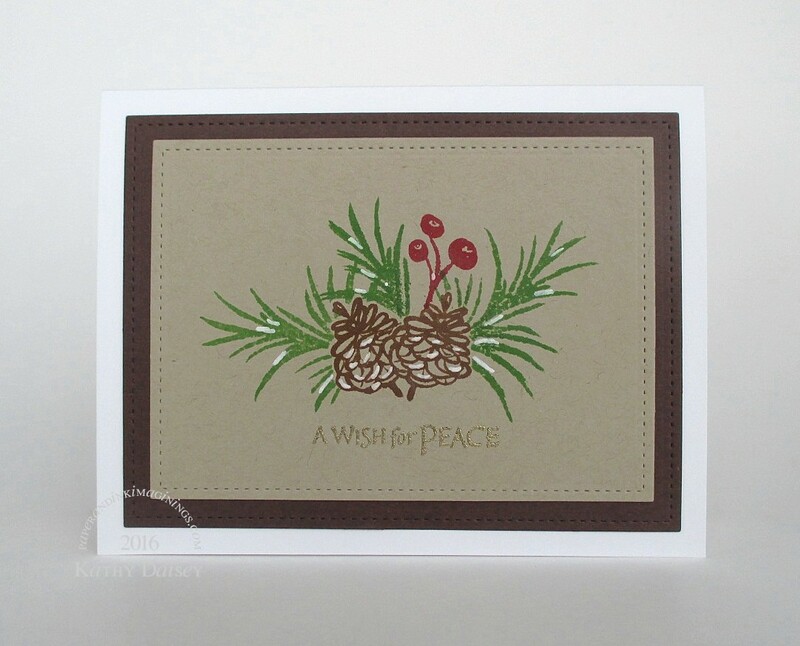 Categories: card, sympathy | Tags: card, Kirarina WiNK, Neenah, Papertrey Ink, PSX Designs, Ranger, Spellbinders, Stampin' Up! | Permalink. This week’s Papertrey Ink Make It Monday Challenge (#184) is titled Dipped Die Cuts, and is about highlighting the edge of a die cut with embossing powder. 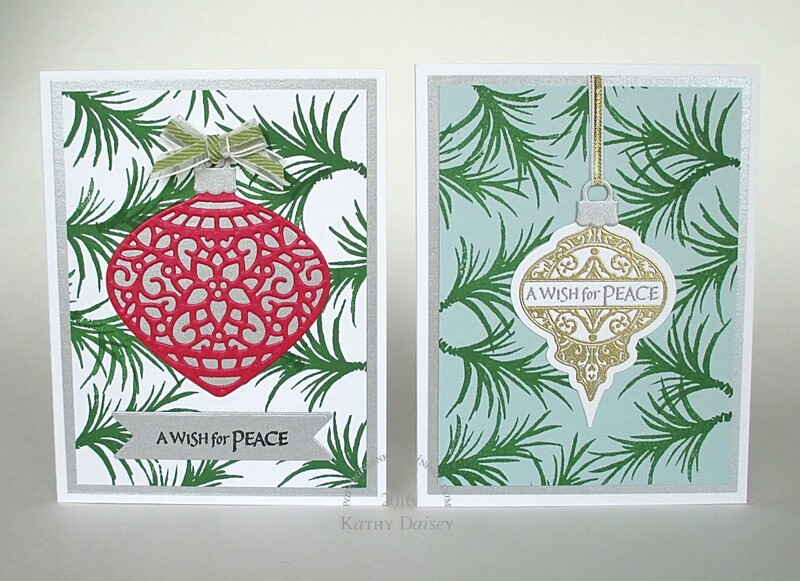 I knew immediately that I wanted to use the Papertrey Ink tree die, and make a holiday card. Digging through my embossing powders, I found a tube of Martha Stewart Sterling Glitter embossing powder. To finish my card, I searched high and low through my stamps (including the ones on the crawl space in the basement – no luck there) to find this old PSX Designs sentiment. Supplies: Stamp – PSX Designs, paper – Papertrey Ink White, Stampin’ Up! Soft Sky, Wild Wasabi (textured), inks – Copic E57, VersaFine Onyx Black, VersaMark, Wink of Stella, dies – Papertrey Ink (tree), Stampin’ Up! (banner), embossing powder – Filigree Fine Art Powder, Martha Stewart Sterling Glitter Embossing Powder, organdy ribbon – JoAnn’s. 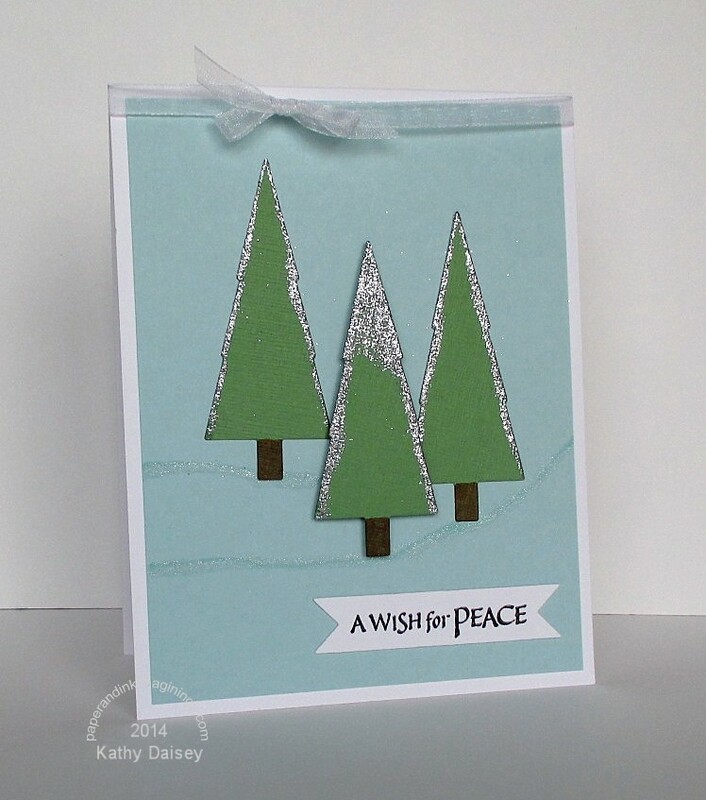 Categories: card, holiday | Tags: card, Copics, Martha Stewart, Papertrey Ink, Papertrey Ink Challenge, PSX Designs, Stampin' Up! | Permalink.